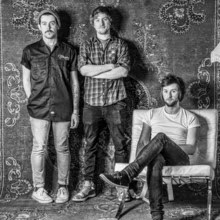 Astounding math-rockmanship from this trio of Brighton wizards. Pulses of asymmetry ripple, jingle, phase, pop and jive towards you leaving you lost counting beats with numbers that probably don't exist. This two-track EP tying 'La Unión De Roku' and 'Demipenteract' was released via Bandcamp back in January 2014 but we're posting now as the band have punted a Kickstarter appeal to fund their next recording. This approach is not unknown of course. Musicians of promise, grit and shrewdness deserve the music-loving public's support at the ticket office and the record store but also in this ramping-up time to keep heads above water. Polymath's latest project ends Fri 16 May 2014 so if you want to be part of this, get it on. If you want to support the band in the more traditional manner, they're in a venue near you soon.